Size 6 - $53.99 Size 7 - $53.99 Size 8 - $53.99 Size 9 - $53.99 Size 10 - $53.99 Only 9 left! They say if you really want to get to know a person, walk a mile in their shoes. Although, walking a mile in Harley Quinn's shoes might be dangerous. The Clown Princess can't step a foot out the door without landing herself in hot water. It's just in her nature to be a little vexing. But did you know there's something about Harley that doesn't vex us slightly? Her high-heels. Displaying an entrancing white, red and black color scheme, these shoes make all of Harley's outfits look pristine. Now, this accessory can act as the cherry on top of your Maid of Mischief costume. Strut into any room like baddie-boss, since you'll be the baddest in the game whenever you wear these shoes. Meet up with Joker to start scheming Batman's demise wearing the Harley heels for women. The heels feature faux leather and faux patent leather uppers. Appliqued diamond pattern decorates each shoe while textured anti-skid soles are on the bottom. The 3-inch kitty style heels are sturdy and comfortable to walk, run and dance in. 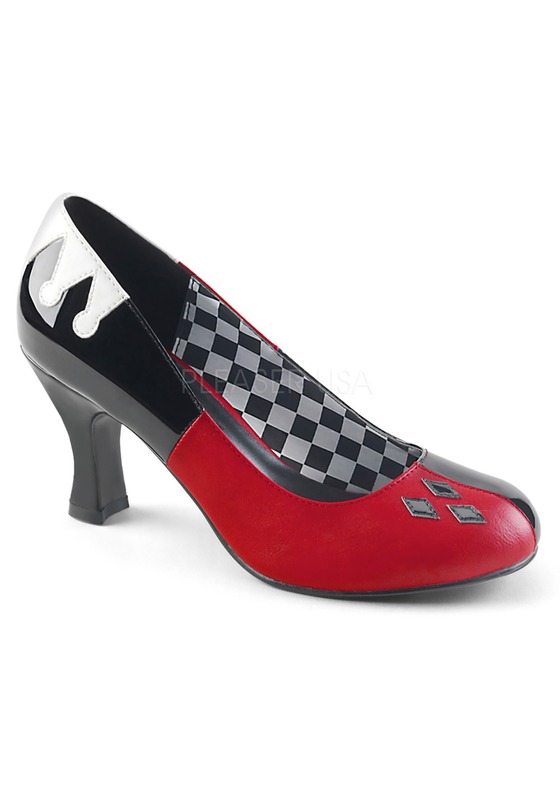 From Harley jumpsuits to cute dresses and sassy corsets, these shoes are perfect for wearing with all types of Harley costumes.